A group that wants lower immigration has forecast if Britain votes to remain in the EU, net migration will exceed 250,000 a year for at least 20 years. The Migration Watch report said a "cautious estimate" for annual net migration by 2035 was 265,000, with 60% of migrants coming from the EU. It said there was complacency about the impact of rapid population growth which it said "could change the UK forever". Remain said leaving the EU and damaging the economy was not the answer. Reality Check: How did EU population of UK grow after 2004? Immigration has been a key battleground in the referendum campaign ahead of the vote on EU membership on 23 June. 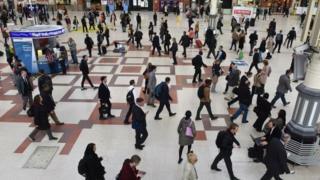 Net migration to the UK rose to 333,000 in 2015, according to Office for National Statistics estimates released in May - the second highest figure on record - figures which the Leave campaign argue illustrates the inability of the UK to control migration while being in the EU. Migration Watch, which campaigns for reduced migration, has now looked over a 20-year period at the impact on net migration in the event the UK votes to remain in the EU on 23 June. Net migration is the difference between the number of people coming to the UK for at least a year and those leaving. It said the figure of 265,000 excluded the possibility of Turkey joining the EU altogether and took the average of the high and low migration scenarios. Under its low migration scenario, net migration from the EU would fall to 135,000 by the end of the period and only a small number of refugees who have already arrived in other parts of the EU would relocate to Britain. In this scenario the government would successfully reduce non-EU net migration to 100,000 a year and British emigration would remain at 50,000 a year, leading to total net migration of 205,000. For the high scenario, net migration from the EU would rise to 220,000 by 2031. In this scenario, non-EU migration would remain at 150,000 per year and British emigration would remain at 50,000 net per year, leading to net migration to the UK to 320,000 in 20 years' time, it said. Lord Green of Deddington, chairman of Migration Watch UK said: "This report is a final wake-up call. Even leaving aside the prospect of Turkey joining the EU, it shows that net migration could still be running at 265,000 a year in 20 years' time. "This would bring our population to 80 million within 30 years. If we remain in the EU there will be nothing to stop a continuing rapid increase in our population. This would change our country for ever against the express wishes of a very large majority of our fellow citizens." Vote Leave said the report confirmed its estimates of future migration levels from the EU and demonstrated that the "only way to take back control of our borders" was to leave the EU. But the Joint Council for the Welfare of Immigrants said the report failed to take account of the "essential contribution" that migrants make to UK industry and the public services, pointing out that they pay more in taxes than they take out. In response to the Migration Watch report, Home Office minister James Brokenshire - a Remain campaigner - said. "David Cameron is in complete agreement with the leaders of the Leave campaign who have admitted Turkey joining the EU isn't remotely on the cards." "Damaging the economy by quitting Europe is not the answer to the complex issue of immigration. Migration Watch say the Leave campaign's policy won't work - it could actually increase immigration. "Independent experts agree that leaving Europe would hit the economy - costing jobs, putting up prices and meaning less money for the Government to spend on public services like the NHS." Former Labour prime minister Gordon Brown is calling for the EU to provide extra financial help to parts of the UK with high levels of immigration to help deal with the pressure on schools, hospitals, housing and other public services. A government spokesman said it was committed to introducing a "controlling migration fund" to ease pressures on public services and to pay for additional immigration enforcement.